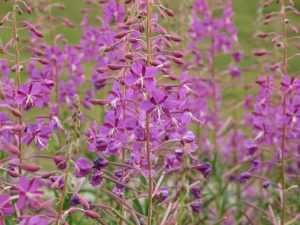 Epilobium (small flowered willow) herb is used for benign prostate hyperplasia and urinary problems. It is a plant that is used around the world for the treatment of prostate, bladder problems (mainly incontinence) and hormone disorders. Research has shown it to inhibit the conversion of testosterone to dihydrotestosterone (DHT) by activity of 5-alpha-reductase and aromatase (the group of enzymes that catalyze the conversion of testosterone to estradiol), two enzymes which are involved in the development of benign prostatic hyperplasia (BPH). The main polyphenols responsible for the inhibition of the these enzymes have been identified as oenothein A and oenothein B. Standard infusion: 2 tsp (3-6g) to 1 cup of boiling water, cover and infuse for 5-10 min then strain.